As many of you may have guessed by now, I’m a gal who likes to eat. In perhaps what may be called a step toward maturity (a rather serious accusation, mind you) I’ve come to like making healthier choices about my food, not just for the heightened nutritional value, but because these techniques I’ve gotten to know also taste great. I’ve come to like my veggies, even when they’re not fried, salted, or cooked in butter. I like trying new things and expanding horizons. However, I’m always wary when I hear that something is low calorie. Most of the time I’ve found these recipes to be so ridiculously adjusted that they don’t taste like what it started as, or is so reduced in portion size I wonder how it was dare called a meal. Luckily, thanks to Pinterest I found a couple of keepers. The first recipe this week is a taco salad. Now, I know a healthy salad is cliché low-calorie eating, but this is full of flavor, full of protein, and is only 250 calories per 2 cup serving, or a Weight Watchers point value of 6. This count includes adding some recommended chicken and avocado, parts I had forgotten when making this. 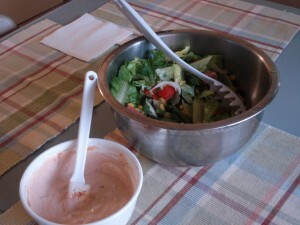 Best of all, the salad dressing is not a standard ranch (something typically paired with taco salad) but a very easy creamy chipotle-lime dressing. To prepare dressing, whisk together ingredients. Done! To prepare salad, combine lettuce and remaining ingredients in a large bowl. To help further lower the calorie count, serve your dressing on the side, dressing as you see fit. This also helps to keep the salad from going soggy. This next recipe is also 250 calories per serving. It stars asparagus – one of my favorite vegetables – and ham in a creamy noodle casserole. It’s a simple and hearty dish; casseroles are great fall dinners not only for being fast and easy, but also for the oven warming up the house enough that you don’t have to turn on the heat on any earlier than you absolutely must. Here in Maryland it probably won’t cool down enough to enjoy that perk for at least another month, maybe longer, but it’s bound to be right around the corner for my family and friends in Ohio and Michigan – I envy all of you for that. Cook pasta in boiling water 7 minutes. Add asparagus; cook 1 minute longer. Drain. Lightly spoon the flour into a dry measuring cup, and level with a knife. Place flour, thyme, salt, and pepper in medium bowl; gradually add milk and broth, stirring with a whisk until well-blended. Melt the butter in a medium saucepan over medium-high heat. Add the onion; saute 4 minutes. Add ham, stir until lightly browned. Add milk mixture; cook until thick (about 4 minutes), stirring constantly. Remove from heat, and stir in juice. 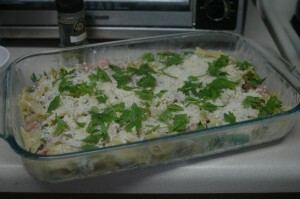 Combine the pasta mixture, spoon into a 2-quart casserole dish. Sprinkle with breadcrumbs, parsley and cheese. Bake at 450 degrees for 10 minutes or until filling is bubbly and topping is golden. 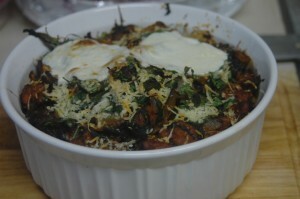 This recipe started as vegetarian, and as good as it looked, I still had to put meat in it. Please forgive me, I’m all about trying vegetarian meals, but I really, really don’t like mushrooms, and therefore will not put them in my own dinner. In every other case I try and swap out ingredients I don’t like for good replacements, but mushrooms have such a distinct flavor and texture that I still haven’t found a good thing with which to replace them – well, at least a non-meat replacement. I’m open to suggestions. Preheat oven to 400 degrees. Slice polenta, then cheese, and set aside. Brown sausage, then stir in onion and garlic. Stir in the remaining ingredients, except the spinach and Mozzarella cheese. simmer, partially covered, 1 hour. Stir in the spinach, thawing it in the pan. Stir until completely broken down and warm throughout. Lightly grease an 8 x 10 inch baking dish. Layer the bottom with polenta, then half the sauce and sprinkle with half the Mozzarella cheese. Repeat these layers. Bake at 400 for 20 minutes, until bubbly. Tip of the Week: As mentioned, salad dressings can really hike up the calorie count of a salad, much how milk can skyrocket the count on a bowl of cereal. Experts suggest having your dressing on the side, dipping each fork load to avoid adding unnecessary calories.